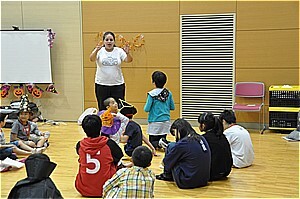 On October 20, we held an event, “Let’s play in English!” for elementary school students in the small hall of Kusunoki Plaza. 18 elementary school students took part in the event. Ms. Hiromi Tanaka, a volunteer, ran a warm-up exercise in easy English. The instructor was Ms. Mercy Vazquez. The participants, who were in Halloween costumes, really enjoyed Ms. Vazquez’s lesson and learned basic words related to weather, color and emotion through physical activity. A member of our association who dressed like Harry Potter read “The Bremen Town Musicians” to the children, using some slides. Toward the end of the program we had a “Halloween walk” in the room. Every child had a small bag and went around each of our 5 staff members, saying “Trick or Treat” and they were given some snacks. The children’s cute smiles warmed our hearts. We hope this event was a good opportunity for them to get more familiar with English.